It's spring! Break out your chintz! Love, love the richness of this design from a Virginia home by Suzanne Rheinstein. Chintz and flowers don't have to be all crazy color and sweetness. 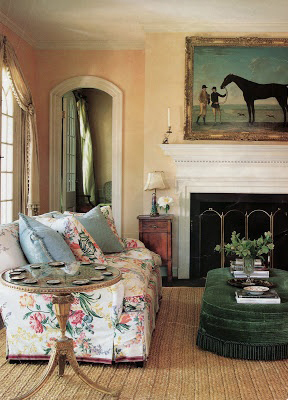 This room shows that chintz can be moody - seems like the perfect space to move from winter to spring. So chic. Have a great weekend as we kick off some warmer months...see you next week! With that rich, luxurious ottoman and the equestrian print, perfect!